Wheatley is the British director responsible for Down Terrace and Kill List. His most current offering, Sightseers, makes pretensions of chaos. It's a black comedy about a vacationing couple whose holiday on the road turns into a killing spree. For Chris (Steve Oram) it begins accidentally (perhaps), but once the impulse is indulged, he keeps indulging it, murdering people who offend his delicate sensibilities in some manner. A dead litterbug is equal to a snobby author driving a better camper. Thinking she needs to join in the fun in order to maintain the relationship, Tina (Alice Lowe), starts killing as well. When Chris disapproves of her choices, she escalates rather than backs down. To his mind, she is acting randomly, he is acting righteously. 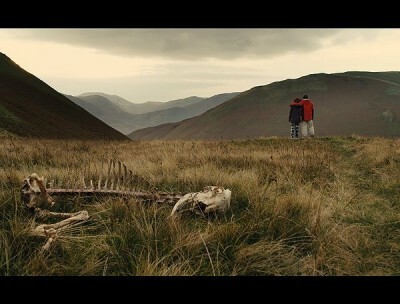 Except there are no random acts in film, and so when a filmmaker like Wheatley attempts to get around engaging in meaningful subtext when making a violent comedy like Sightseers, the result tends to come off as shallow and adolescent as a "card-carrying-anarchist" punchline. Sightseers actually joins a spate of recent movies, including James Gunn's Super and Bobcat Goldthwaite's God Bless America, that puts misanthropic men on a violent path that begins with them enacting a justifiable retaliation against some supposed offense, only to acquire a taste for blood and keep acting out for increasingly petty reasons. All the while, a woman cheers him on and, quite often, takes it even farther. All these films maybe begin with a thin veneer of satire before devolving into empty action. Is Chris waging a kind of class war when he kills the man with the new model vehicle or the guy who went to private school and wants to order him around like a serf? There is a point where Wheatley and his actors, who are credited with the screenplay, seem as if they'd have us believe as such, but it's not a defense that would hold up in court.